Computer Sciences and/or Engineering students have the opportunity to join TSA. The mission of the Technology Student Association is to foster personal growth, leadership, and opportunities in technology, innovation, and engineering. Students apply and integrate technology, science, engineering, and mathematics concepts through co-curricular activities, competitive events, and related programs. The Russellville High School Renaissance Foundation is a program developed to promote better citizenship as well as academic excellence among our student body. Our goal is to increase student performance and teacher enthusiasm. 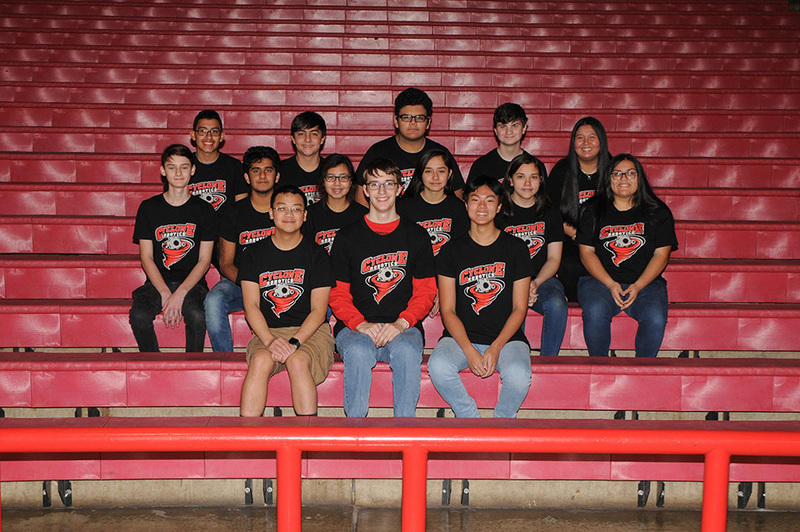 The renaissance student board consists of a selected group of high school students who desire to strengthen their leadership skills and community involvement. This group meets with community members to learn about area businesses, the importance of leadership, and how to be contributing members of the community. The students also select student/teacher of the month, create bulletin boards, and provide tours for upcoming freshmen during transition day. Other renaissance programs include ACE Awards, Celebration of Excellence, Cyclone Achiever, and Distinction Banquet. Student Council strives to preserve the good name and traditions duly allotted to a student council. This shall be done by assisting with extra-curricular activities, encouraging a better student-faculty relationship, and by promoting better citizenship, scholarship, and high ideals with the school. Membership consists of a president, vice-president, recording secretary, corresponding secretary, treasurer, representatives, class president, class officers, and a faculty advisor. Each office is elected by a popular majority vote of the student body. The election is held in the spring of the preceding school year. Each office has its own criteria in order for a student to run for office. The purpose of the National Honor Society is to create an enthusiasm for scholarship, to stimulate a desire to render service, to promote leadership, and to develop character. To be eligible for membership in the RHS Chapter of National Honor Society, a student must have been enrolled in Russellville High School for one full semester as a member of the sophomore, junior, or senior class and must have a cumulative grade point average of at least 3.5 (on a 4.0 scale) Once inducted, students must maintain all standards of the chapter to remain members of the National Honor Society. National Beta Club is a non-profit, leadership-service organization for high school students. Its purpose is to stimulate effort, reward achievement, and encourage and assist its members to continue their education after high school. Membership is by invitation only. To be eligible for membership, a student must have been enrolled in Russellville High School for one full semester as a member of the sophomore, junior, or senior class and must have a cumulative grade point average of at least 3.0-3.49 (on a 4.0 scale). Qualifications for membership are worthy character, good mentality, creditable achievement, and commendable attitude. Interact is a Rotary-sponsored service club for young people. Made up of members from grades 10-12, Interact gives young people an opportunity to participate in fun, meaningful service projects. Interact performs at least two projects a year, with the one serving the community and the other furthering international understanding. Along the way, Interactors develop their leadership skills and initiative while meeting new friends. Through their service activities, Interactors learn the importance of developing leadership skills and personal integrity, demonstrating helpfulness and respect for others, understanding the value of individual responsibility and hard work, and advancing international understanding and good will. The club's motto is "Service Above Self." The Tri-M Music Honor Society is the International Honor Society for high school students. It is designed to recognize students for their academic and musical achievements, reward them for their accomplishments and service activities, and to inspire other students to excel at music and leadership. There are more than 5,500 chapters and Tri-M has helped thousands of young people provide years of service through music in schools throughout the world. The High School Science Club is open to any student in grades 10-12. The Science Club holds meetings to address current topics of interest in many scientific disciplines, including biology, chemistry, and the physical sciences. The Science Club also arranges activities focusing on advanced laboratory explorations both on and off campus. All activities are paid for through fundraising and by club participants via club dues. The mission of the Hispanic Heritage Club is to promote and educate about Hispanic culture and history. Students will work together on various initiatives and projects to learn about the issues, contributions, and history of Hispanic people. Additionally, the club will focus on school and community service. All RHS students are welcome to be a part of the Hispanic Heritage Club. Quiz Bowl is an Arkansas Activities Association sanctioned team which competes in the 6A West Region and 6A State classifications. The RHS team competes in games with other schools, at invitational tournaments and in the 6A region and state tournaments. 6A Region and State championships are awarded in quiz bowl play. Players use their knowledge, skills, tactics and strategies to score points in four-quarter games. Quiz bowl topics of which players must be knowledgeable and skilled include math, science, history, literature, language arts, art, music, popular culture, mythology, sports and current events, among many others. Some quiz bowl players use knowledge from many areas to compete, while other players may be “specialists” in one or two topics. The Teenage Republicans is an official GOP auxiliary, that is dedicated to training young people to help elect Republican candidates in local, state, and national offices. The purpose of the Young Democrats is to inform people on progressive issues, and to help train the next generation of Democratic leaders. We pledge to pursue the ideas of liberty, justice and freedom for all. We also aim to stimulate in young people an active interest in government affairs, be visible in our community, and contribute to the growth and influence of the ideals and philosophy of the Democratic Party. The purpose of CSU is to promote Christian values among high school students and all whom they influence through fellowship, outreach, and example. CSU is a student-led club open to all students that support the purpose. FCA's mission is to present to coaches and athletes, and all whom they influence, the challenge and adventure of receiving Jesus Christ as Savior and Lord, serving Him in their relationships and in the fellowship of the church. FCA's vision is to see the world impacted for Jesus Christ through the influence of coaches and athletes. Women’s Leadership Organization (WLO) of Russellville High School aims to create a community that promotes human rights through discussions, volunteer work, and awareness campaigns while striving to be inclusive of all groups of people and empowering young women to be leaders in the campaign for human rights in order to create a social order that is based on fairness and equality. Muse Literary Magazine is an organization that strives to provide an outlet for creativity by giving students of Russellville High School the opportunity to express their individuality through literary works, photography, and other visual arts. Each year, interested students may complete an application and obtain teacher recommendations to be considered for the following year. Staff members are required to participate in a two-day summer camp and after school meetings. The students on staff have the opportunity to attend field trips with a focus on writing and the arts and provide them with opportunities to work with professional writers, actors, musicians, artists, etc. In addition, the Muse Literary Staff members attend Arkansas Scholastic Press Association convention, a two-day journalism workshop and awards competition each April. The purpose of the GSA Club is to promote tolerance, understanding, cooperation and community among high school students and all whom they influence through meetings, outreach and example. The GSA Club is a student- led organization open to all students. Meetings are conducted before and/or after school. Student Congress is a debate team that competes throughout the year and in two major competitions, one each semester. The major fall competition is the Arkansas Student Congress and the major competition in the spring is the Arkansas Tournament of Champions. These competitions utilize Robert's Rules of Order to facilitate the various rounds of Congressional Debate. The debaters write bills of their own, and argue in affirmation or negation of bills written by other students. State level debaters qualify for the National Speech and Debate Honor Society. The purpose of FCCLA is to provide students with opportunities to develop leadership abilities while focusing on the aspects, skills, and theory within the curriculum. Membership is open to all students in secondary schools who are taking or have taken courses in the Home Economics Department. DECA is an association of Marketing students. Their mission is to prepare emerging leaders and entrepreneurs in marketing, finance, hospitality and management. In addition to being business oriented, they strive to help the community by volunteering and helping local and state charities such as the Salvation Army Angel Tree, Arkansas Children’s Hospital and the MDA. PEACE stands for People Encouraging Active Change and Exchange. We welcome students from all walks of life, use open dialogue and service to meet the needs of our school and community, promote cultural awareness, embrace diversity and tolerance, and encourage positive change. The International Thespian Society is for students serious about pursuing theatre studies. The society focuses on theatre education and students work in all areas of theatre, plus community outreach and advocacy. Troupe 7260 participates in several annual events that help raise awareness about live theatre. Students are encouraged to participate in the Arkansas State Thespian Festival and the International Thespian Festival in Lincoln, Nebraska. The purpose of the FBLA is to inform students of business opportunities and procedures. The Sociedad Honoriaia Hispanica is a National Honor Society for Spanish students. Requirements for membership are a 3.5 GPA for 3 semesters of Spanish, an overall 3.0 GPA, and evidence of good citizenship. New members are inducted in February. The SHH offers a variety of opportunities and activities to its members. Battle of the chapters winners from FBLA fall conference.